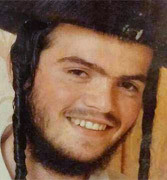 Oct 3, 2015 - Rabbi Aharon Bennett, 22, of Beitar Illit was stabbed to death by a Palestinian terrorist near Lion's Gate in Jerusalem's Old City on Saturday evening. His wife and 2-year-old son were wounded. At around 7:30 p.m. on Saturday evening (October 3, 2015), a knife-wielding Arab attacked Aharon Bennett, his wife, their 2-year-old son and baby daughter who were on their way to pray at the Western Wall in Jerusalem's Old City. Rabbi Nehemia Lavi, an Old City resident and IDF reserve officer, went down with his gun to try and save those wounded by the Arab terrorist in the attack, but the terrorist stabbed him and seized his weapon. Lavi and Bennett, who were stabbed in the upper body and were unconscious when paramedics arrived at the scene, died in hospital shortly afterwards. Bennett's wife Adele was seriously wounded. Their 2-year-old son was lightly wounded and the infant was unharmed. Rabbi Aharon Bennett, a member of the Breslov Hassidic community in Beitar Illit, was an IDF soldier through Project Shahar, which integrates haredim into the army. He was posthumously raised to the rank of corporal. Aharon Bennett will be buried in Jerusalem. He is survived by his wife Adele, their 2-year-old son and infant daughter.